Two divorces have taught Mariela Estevez that she’s better suited to being a mistress than a wife. Whose heart needs all that forever after trouble? Still, her affair with her married lover, Hector, has become problematic especially because he’s also a tenant in her apartment building in the heart of Miami’s Calle Ocho in Little Havana. But when Hector is found dead just steps from Mariela’s back door, on the eve of her fortieth birthday, she’s forced to examine her life and come up with a plan to save it, fast. After divorcing two cheating husbands, Mariela decides marriage is not for her and, ironically, feels it’s better to be the other woman. Thinking it would be less complicated, she vows to only have affairs with married men; however, she soon discovers that this has it’s own set of problems – not the least of which is that her current lover, Hector, is now dead and she is a prime suspect. Soon after Hector’s death, Mariela begins to have clairvoyant visions. It had been years since she had been able to ‘see’ things, a gift she inherited from her mother. Now she is having visions of others tenant’s secrets – bits and pieces that could help her put together the events of Hector’s death and clear her name. Even though Mariela has made some bad choices in her life, she is a likable character who learns and grows from her experiences. 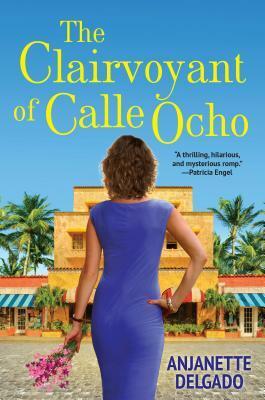 Filled with clever, witty dialog, a cast of colorful characters, and set in the vibrant Cuban culture in Little Havana, this was a charming and delightful read. A little bit chic-lit, a puzzling mystery, some mysticism and a lot of fun – I quickly flew through the story not wanting it to end. The narration, performed by Roxanne Hernandez, was a pleasure to listen to. She moved at a brisk, but steady, pace making for an engaging listen. Her voices for the characters were fun and full of life and, while there were more than a few characters to remember, her distinctive voices made them stand out. The dialog had Spanish words and phrases scattered throughout and it was nice to hear, rather than read them. I alternated between print and audio, but in the end found it a delightful and easy book to listen to – and one I would recommend to those new to the audio format. This sounds fascinating, Leslie, although I agree with Kathy about the choices. I’m glad you enjoyed the audio version.